Our Sweet Love Story: 34 Weeks ~ Happy St. Patrick's Day! 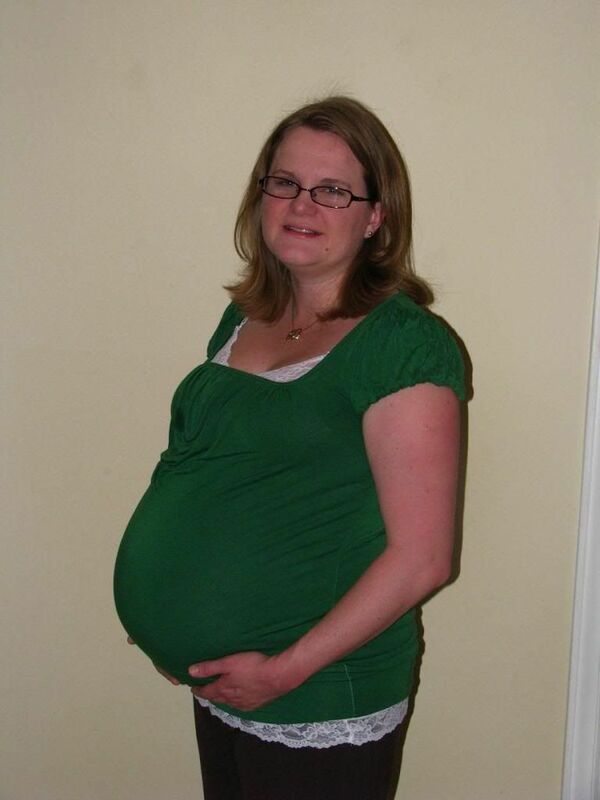 Here is a picture of the enormous pregnant lady in her festive green for St. Patrick's Day! I don't know if I am really that much bigger than when I had Evan, but I feel gigantic! And my feet and ankles decided to swell this week. Mostly, I think due to some new shoes I purchased. They seemed comfortable, but they were flats so I think they didn't offer enough support. I am hoping the swelling goes down soon, but I don't have time to keep my feet propped up all day. Six weeks still seems like such a long time to go. I am ready to meet this little guy and hold him in my arms. Maybe seeing him on the 3D ultrasound didn't help matters because it just makes me much more anxious to see him. Brody also had a nice baby shower from Mommy's co-workers yesterday so he has some nice new things to go along with all the hand-me-downs. His room is coming together nicely. We are going to be pretty busy for the next few weeks, and Mommy is just getting so tired and finding it more and more difficult to just move around. Evan's 4th birthday is in a little over a week so we have a big birthday party planned. I have lots of school stuff to finish up. We still have some work to do in the nursery. I feel like Eddie is having to do everything around the house these days, and I feel so guilty. He does so much...taking care of Evan, cooking, cleaning, taking care of me, paying the bills, and working his full-time job. He is definitely my hero, and I am so lucky! I hope I can make it up to him soon! Please continue to bless our family with health and happiness. We are so excited about the future ahead of us, but we need your strength to help us make it through the rough times. You have always brought us through no matter what the obstacles. We ask that you keep Brody safe through the journey ahead.